Is a Non-Adversarial Divorce For You? get started with filing your court papers. Un divorcio no contencioso es una versión simple de un divorcio regular. Usted tendrá que cumplir con ciertas condiciones para poder calificar. Si usted califica, usted puede obtener un divorcio dentro de 35 días y no tiene que presentarse en la corte. Esta lista le ayudará a verificar si califica para un divorcio no-contencioso y empezar a radicar sus papeles de corte. Who Can Get a Non-Adversarial Divorce? The marriage lasted 8 years or less. No children were born or adopted before or during the marriage. Neither spouse has any real estate (also called real property). The total value of the belongings the spouses own together is less than $35,000. Neither spouse has a company-sponsored pension plan. Neither spouse has a pending bankruptcy. Neither spouse is applying for or getting Medicaid benefits. A divorce is not already in progress. There are no restraining or protective orders between the spouses. You can find out more about qualifying by reading this pamphlet by the State of Connecticut Judicial Branch. You and your spouse will need to file form that says you meet the conditions that qualify you for a non-adversarial divorce. The paper must be notarized, which means you will need to swear that the information in it is true and sign it in front of the court clerk. 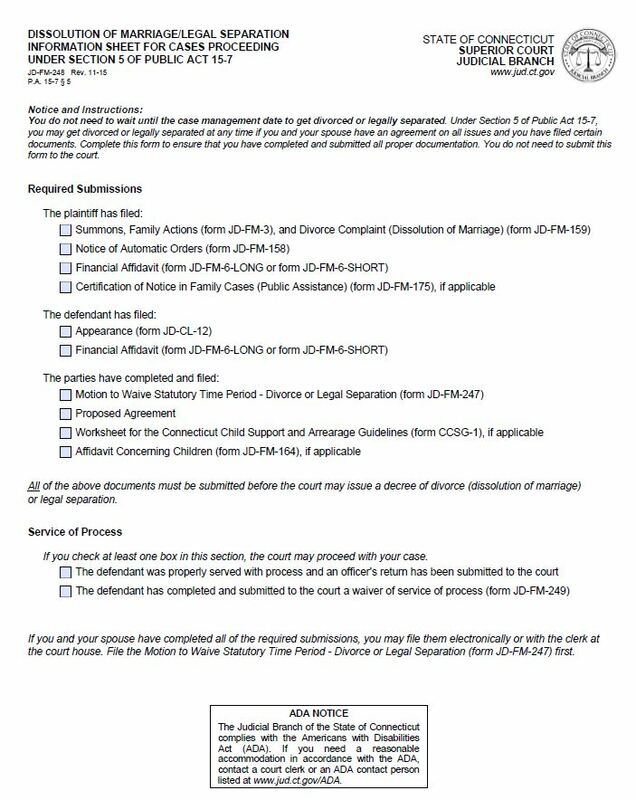 The Judicial Branch has a checklist with all the forms you will need to submit. It can be found here: http://jud.ct.gov/webforms/forms/FM242.pdf. If you need help understanding what is on this list or filling out the forms, you can go to a Court Service Center, located at most courthouses. Going to court can be stressful. This video will cover everything you need to know about getting ready for a court hearing, including what to wear, who to bring with you, what happens when you see the judge, meeting with a mediator, and more. We hope that you'll feel more at ease and prepared after you watch this video.